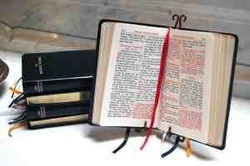 There are a variety of prayer books and breviaries available for Western Rite Orthodox Christians to use for their personal devotions. A breviary or divine office book in traditional English for the daily use of clergy and laity in the Western Rite of The Orthodox Church. Contents: The Western Rite Calendar, full Psalter (with plainsong music & psalms pointed for chanting) based on the Septuagint; the Ordinary and Propers for feasts, ferias, seasons, and Saint’s days. Includes Matins, Prime, Terce, Sext, None, Vespers, Compline; Anthems of Our Lady, Office of the Dead and for the Sick, Itinerary; Preparation for Liturgy, Thanksgiving after Liturgy, Grace at Meals, Sacrament of Penance (Confession), Gradual Psalms, Penitential Psalms, various Litanies, and many Prayers and Office Hymns. All text in black with rubrics in italics. Available to purchase from Lulu in hardback or paperback format. A missalette or handheld “people’s'” edition of “The Orthodox Missal according to the Use of the Holy Orthodox Church” (ROCOR altar edition), by Abbot David Colburn. This missalette contains: Ordinary of the two Western Rite Liturgies (Masses) of St. Gregory and of the English Liturgy; Rite of Penance; Preparation for Liturgy; Thanksgiving after Liturgy; Anthems of Our Lady; and other prayers. All text in black with rubrics in italics, and text in this edition is the same as the paperback edition also for purchase here. Available to purchase from Lulu in hardback and paperback format. The traditional prayer book of the Benedictine monks of the Western Patriarchate of the Orthodox Church. The Monastic Office was first set forth in all of its essential features and in much of its detail about the year 535 A.D. in the Holy Rule of St. Benedict, the father of Western monasticism. It was the first complete and enduring order of daily praise and prayer in European Christendom. For over fourteen hundred years it has voiced the worship of an ever-increasing circle of devout men and women. It came to England with St. Augustine, the first Archbishop of Canterbury, and it was the Prayer Book of those who more than any other monastic tradition formed and influenced the church in England – men such as St. Wilfrid, St. Benedict Biscop, the Venerable Bede and St. Dunstan. For centuries the Archbishops of Canterbury wore the Benedictine habit, and many of the greater English cathedrals resounded with Benedictine praise. The Monastic Office was planned from the first for busy men, working at both mental and manual labour. Its recitation was called by St. Benedict the Work of God, ‘Opus Dei’; the primary spiritual labour ‘to which nothing is to be preferred’. Available to purchase from Lancelot Andrewes Press. The ancient Night Office of the order of the Benedictine monks. Can be used in conjunction with the seven canonical Hours of the Monastic Diurnal. As well as the prayers of the Night Office, the Breviary contains seasonal readings from scripture, the Lives of the Saints and writings from the Fathers of the Church. 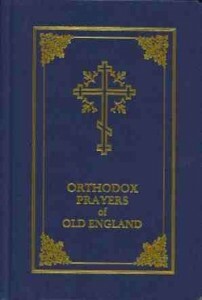 Traditional Western Rite Prayer Book for Orthodox Christians. 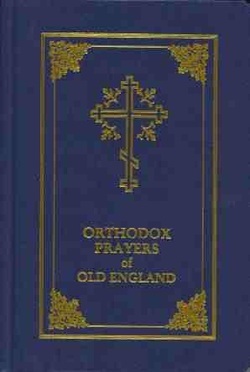 Contains a full set of daily prayers and offices, as well as various litanies, the seven Psalms, the fifteen Psalms, the Hours of the Blessed Virgin and the holy Guardian Angel, the offices of Baptism, Confession, Burial and Marriage as well as the Divine Liturgy in its traditional form as the Liturgy of Saint Peter, and its English use, the Sarum Rite.